It’s Time To Close The Digital Divide! Today, the term ‘inequality’ is everywhere – on TV, in newspapers and magazines, and more and more frequently, online. But the area of ‘inequality’ that’s not getting enough attention is the ‘digital divide’! The digital divide is an economic inequality between individuals and groups, in terms of who has access to, use of, and knowledge of computers, information and communications technologies. It refers to inequalities between individuals, households, businesses, and geographic areas at different socioeconomic and other demographic levels. Who has access to high speed internet, desktop computers, laptops, smart phones, tablets such as iPads, electronic book readers, MP3 players, Xboxes or PlayStations? Studies show that individuals and groups at higher economic levels have much greater access to these technologies than those at lower economic levels. And this matters, a lot, because those with greater access have enhanced advantages and opportunities for acquiring information, education, economic resources, and services (including online medicine where patients at home will be able to speak with their doctors, and thus gain access to lower-cost, higher-quality care). This all translates into enhanced advantages in achieving cultural and social capital, as well as mass economic gains due to dramatic increases in terms of productivity. And it, definitely, has implications for churches, congregations, and ministries in poorer communities, which would lag behind others in possessing and employing digital technology to spread the gospel, joining in online religious and social conversations, accessing resources, and enhancing internal communications. One of the most important social, economic, and ethical questions facing us today is this: How can the incredible benefits of the internet, and information and communications technologies be made available to a broader range of individuals and groups, especially churches and ministries in disadvantaged communities? What if churches in poorer communities partnered and collaborated with more ‘technology rich’ churches and ministries for their mutual benefit? What type of impact would that have? 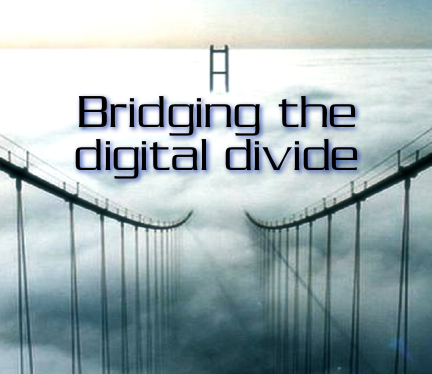 It’s, definitely, time to close this ‘digital divide’ so that everyone can benefit from the tremendous possibilities and benefits of these rapidly evolving digital technologies, which are so important to communications, information, and to one’s ability to succeed in a myriad of fields in today’s digital world. Let’s make sure no one gets left behind! Has the digital divide affected you? What examples can you give, or suggestions can you make, for helping to close the digital divide?